QUANTICO, Va. (June 22, 2015) -- Army fans were all aquiver when scores were finally announced at the archery competition during the 2015 Department of Defense Warrior Games here, June 22. Current and veteran Soldiers took home every gold medal, which was up for grabs. Military archers from the Army, Navy, Air Force, Marine Corps, Special Operations Command and United Kingdom competed in both compound bow and recurve bow archery during the day-long event at the Lejeune Field Tent. 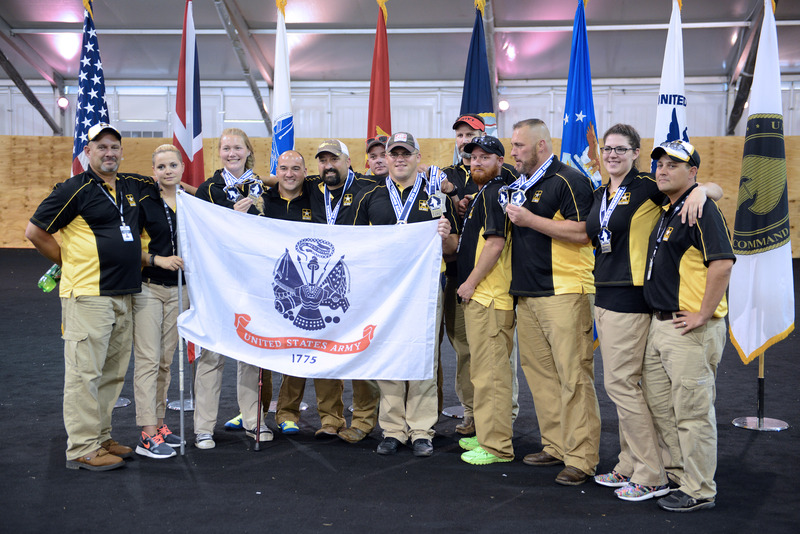 Team Army took four gold medals, one silver medal and one bronze medal in the archery competition at the 2015 Department of Defense Warrior Games in Quantico, Va., June 22, 2015. By the end of competition, Team Army had earned four gold medals, one silver medal, and one bronze medal - for a total of six. Perhaps the most spectacular performance came from Team Army's Chasity Kuczer. She was one of two Team Army members, who ended the day with not one, but two gold medals. Kuczer earned hers wielding the compound bow during both team and individual competition. Coming out of the first of two 300-point rounds, Kuczer had scored 286 points. "She's 13 points ahead of the next person behind her. They are all in a 13-point deficit even going into this," said Team Army archery coach Jessie White. "For somebody to come in and beat her out of it is going to be tough. She's not going to back down. She's on the gas pedal and intends to run until it's over." After scoring top marks in both 300-point rounds, Kuczer went on to compete for the gold. Before that competition started, her confidence was as high as her scores. "I'm hoping pretty damn good," she said of her chances of taking home the gold. Kuczer said getting where she was at mid-competition took a lot of practice and trying not to think too much. "My biggest thing is, I get in my head, and if I do that I start overthinking the shot and I start missing stuff," she said. "So stay out of my head." She said chanting and cheering by Team Army fans, arguably the loudest of all the fans in the field tent, helped her to do better. "It actually pumps me up," she said. "I kind of relax a little more when they do that." By the end of the day, Kuczer had earned not just one gold medal, but two. She beat her Marine competitor for the gold in compound bow by just one point. Marine Corps veteran Sgt. Clayton McDaniel took the silver in compound bow. Army Reserve Sgt. Colten Harms took bronze. Army veteran Sgt. Sean Hook took home two gold medals in recurve bow archery at the 2015 Department of Defense Warrior Games in Quantico, Va., June 22, 2015. Kuczer competed against both men and women in the competition. Archery this year was not split by gender. She said that wasn't a problem for her. "I've always had to deal with 'oh, you're a girl and you can't shoot.' But I've been in a lot of male-dominated things," she said. Adding advice for women in the Army who may one day move into the newly opened combat arms career fields, she said "Don't let the guys push you down. You can excel and become better than them. Keep driving on." For the compound bow team competition, Harms, Army veteran Capt. Frank Barroquiero and Kuczer took the gold. Kuczer, who is still in the Army as part of the Warrior Transition Battalion on Fort Knox, Kentucky, said she hopes to get involved in the Army's World Class Athlete Program and the Paralympics. Over on the recurve bow side, Army veteran Staff Sgt. Billy Meeks took the silver in the individual competition - losing out to Army veteran Sgt. Sean Hook for the gold. 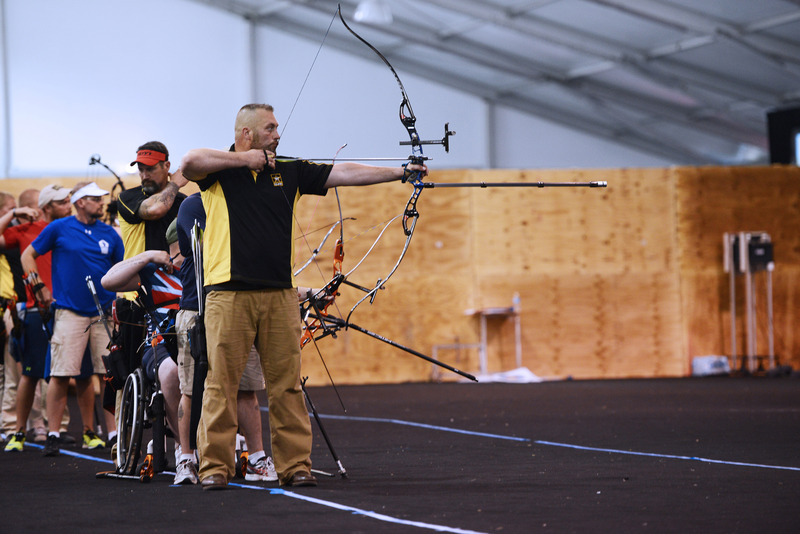 Petty Officer 3rd Class Jamie Byrd, of the Navy, took bronze in the recurve bow individual competition. Meeks said that he and Hook planned and practiced to go head-to-head for the gold and silver in the individual competition on recurve bow. "Me and Sean Hook actually trained so we could shoot together and make it to where we came out - in the silver/gold match," Meeks said. "Both of us shot our average, which is what we came out to do. That was the whole plan: shoot your game one arrow at a time. What happens, happens. If we win, we win. If not, we know we did our best." But Meeks still went home with a gold - and a silver. As part of the recurve bow team competition, he, Hook and Army Reserve Spc. Sydney Davis earned the Army another gold medal. "I feel like we were bike riders," said Meeks of the camaraderie and teamwork on Team Army. "We were pulling each other all together at the same time. Everybody was just drafting off each other. It was an amazing feeling having so many people on the podium." White said he "can't be more proud" of what the team accomplished during the 2015 DOD Warrior Games. "They literally won every single gold medal of the competition," he said. "You give them the tools and they come and they do exactly what you hope they will do. They put the work in and they deserve every bit of it. It was all about the team from day 1 with this group. Even in all the training camps, it's been about the team. That's how they win."